Moving Beyond the “Illegal Immigrant” – The Associated Press Drops the Pejorative Term. Who’s Next? The AP dropping the I-word also has wide ramifications not just for the media, but also for the way we view and treat people. ”Illegal” or “illegal immigrant” is a dehumanizing pejorative imbued with violence and oppression. I have written at length about how “illegal immigration” and hence, “illegal immigrant” came to be part of our lexicon through the construction of true and false immigration. There is no coincidence that the legal history of deportations coincides with the use of more virulent language to separate desirable immigrants from undesirable immigrants, and castigate the latter as undeserving of any civic or political rights. actions against them, actions that now take the form of workplace raids, detention and deportations. Changing such language then, does help to make it more difficult to castigate people as undesirable and unwanted. Overstay: Someone who overstays her admission to the country. An overstay may or may not accrue unlawful presence, and may simply be out of status. Entry Without Inspection (EWI): Someone who enters the country without inspection or proper admission. An EWI may still be eligible for admission without leaving the country. Immigrant: A green-card holder whether through admission or adjustment of status. 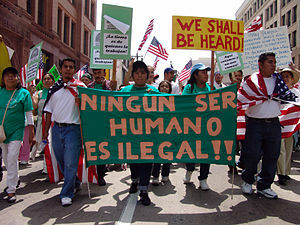 Non-immigrant: Anyone who is in the U.S. temporarily with legal status but is not a green-card holder or U.S. citizen. Asylee: Anyone granted asylum in the United States due to past persecution or well-founded fear of persecution in their home country. These are merely suggestions. As always, I’d err on the side of people defining themselves. I also think it is quite possible to write a story about an immigrant or immigration reform without necessarily having to categorize the actions of people who may be here without proper authorization. Maybe now, news organizations beyond the Associated Press can focus on covering new stories and opinion pieces about the lives of actual people as opposed to painting us all with the brush of a lazy, inaccurate and dehumanizing pejorative. There is something to be said about the continued raids, detention and deportation of undocumented immigrants, despite the change of language. While it is too soon to declare victory in terms of the treatment of irregular or unauthorized immigration, and the AP will continue using the phrase “illegal immigration” as a way to describe immigration outside the law, this is a step in the right direction. AP Drops the I-Word – Does the New York Times Care? ← How would a Supreme Court ruling striking down DOMA affect immigration?